REPORT of a Court of Inquiry held at Calcutta into the circumstances attending the stranding of the British s.s. "CONGELLA," on an uncharted shoal off the coast of Natal, on the 11th March last. 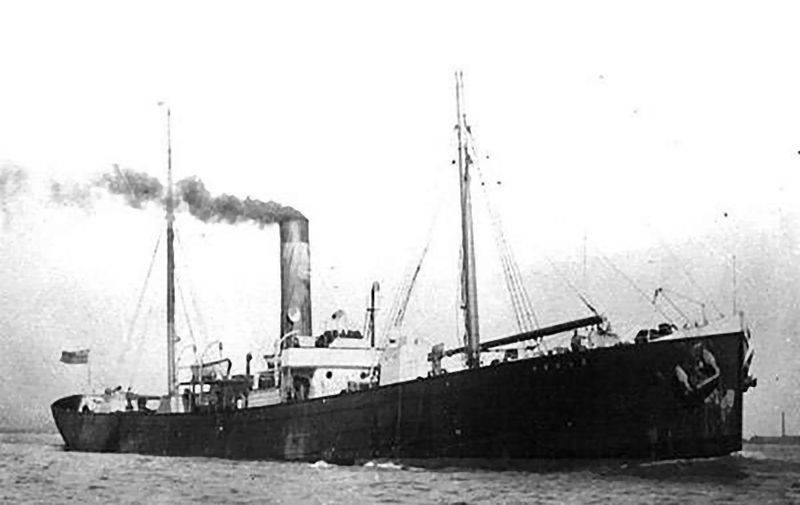 On the 11th March, 1906, the s.s. "Congella," of 1,022 tons, commanded by Capt. R. E. Keen, master, was coasting northwards along the South East African Coast from East London towards Durban, steering a course between one and one and a half miles off the coast. Captain Keen came on the bridge at 7.30 p.m. on the 10th March. At 3.45 a.m. of the 11th March the St. John's River light was abeam 1 1/4 miles distant. The patent log read 34 miles, and the course was altered to N. 70º E. (C) N. 48º E. (T). From 5.30 a.m. till 6 a.m. Captain Keen was off the bridge, returning to it, however, two or three times during this period. During Captain Keen's absence, Mr. Plafer, the chief officer, was on the bridge. At 6 a.m. the course was altered to E. 1/2º S. (C) N. 74º E. (T). At 6.24 a.m. Waterfall Bluff was abeam, distant 1 1/2 miles. The patent log read 61 1/4 miles. The course was altered to N. 65º E. (C) N. 43º E. (T). At 7.43 a.m. the South Sand Bluff was abeam, distant 1 1/2 miles, log 75 miles. At 8 a.m. the chief officer came off the bridge and gave the course N. 65º E. (C) to the third officer, Mr. Lloyd, with orders not to go within a mile of the coast. Captain Keen went on the bridge again about 8.20 a.m. At 8.30 a.m. the course was altered to N. 60º E. (C) N. 38º E. (T). At 10.15 a.m. North Sand Bluff was abeam, distant 1 1/2 miles, from point bearing. The course was altered to N. 55º E. (C) N. 33º E. (T). The vessel was being navigated with the help of charts Nos. 2087 and 2088, published at the Admiralty (Africa, South East Coast, Sheets VI. and VII. ), and Sir William Thompson's compass. At 10.50 a.m. Captain Keen observed that the water close inshore looked slightly discoloured, and had a cast of the lead taken. The soundings, according to the charts, should have been 15 or 16 fathoms. On the deep-sea lead being hove a depth of seven fathoms was obtained. The vessel was going at about 8.5 knots. The tide was dead low water spring tide. Directly Captain Keen got seven fathoms, he gave the order to port the helm. As the wheel was being put over the vessel went aground. He then gave the order "Hard a port," and rang the telegraph "Full speed astern." The ship brought up on what Captain Keen took to be hard sand. Soundings were immediately taken, and 15 ft. were found nearly amidships. The bow and stern soundings gave 18 to 20 ft. The vessel, when she struck, was, according to the evidence of Captain Keen and his officers, a good mile off the shore. Orders were given by the captain to get a boat ready and a bridge anchor put in, and the aft tank was nearly pumped out. The vessel was aground for about 15 minutes. While she was aground, Captain Keen took a bearing of the North Sand Bluff S. 83º W. (C) magnetic S. 58º W. (T). The ship's head was W.S.W. just before she floated. The deviation of the compass before the accident on the N.E. course was 3º E. After the accident the deviation in the same course was found to be 9º or 10º W. At the time of the accident the weather was fine with a slight south-westerly swell rolling up the coast. Immediately the ship grounded the engines were put "Full speed astern," and kept going until the ship's head slanted round inshore, and she came off the rock. The tanks were sounded, and it was found that there was no difference in those containing water; no water was found in the holds. At 11.53 a.m. the ship proceeded N. 67º E. (C). Error 34º W.N. 33º E. (T). At 1 p.m. the course was N. 67º E. (C). At 4 p.m. N. 63º E. (C) was recorded. Error 34º W. At 4.47 p.m. the course was altered E. by compass 33º W. Error. At 5.53 p m. the Aliwal Lighthouse was abeam, 5 1/2 miles. Distance by log 59 miles. The course was then altered to east as Captain Keen wished to pass on under the Aliwal shoal, as it was getting dark, and the compass was unsteady. The grounding of the vessel was reported by Captain Keen to the port officer at Durban, where the vessel was surveyed and received a certificate of sea-worthiness, and proceeded to Calcutta. The s.s. "Congella" was surveyed in the dry dock at Howrab on the 13th and 18th April, and it was found she had been badly damaged along the keel and the adjacent stretcher to nearly three-quarters of the length of the vessel. The rock on which the vessel grounded is in 31 1/4 º S. (Lat. ), and 30º 18' E. (Long. ), and is uncharted. From the evidence of Captain Keen and his officers and also that of Captains McDougall and Carr, the course steered by Captain Keen on this occasion was the course which is always taken by vessels coasting along this coast. They state it is the common recognized custom of ship masters to navigate between one and one and a half miles from the coast. This is done to keep clear of the southerly current which is much stronger further from the coast. On a careful consideration of the evidence before us, we find that the s.s. "Congella" struck on an uncharted rock in 31 1/4º S. (Lat.) and 30º 18' E. (Long.) while on a voyage from East London to Durban, along the south-eastern coast of Africa. We are of opinion that as the vessel was being navigated under the immediate supervision of the master, Captain Keen, in day time and in fine clear weather he was justified in steering a course N. 33º E. (T) from a position 1 1/2 miles S. 55º E. off North Sand Bluff, as we have it in evidence that he intended to haul out in making the Port Shepstone Lighthouse, and the foul ground marked on the chart in its vicinity. As the coast, from the evidence before us, appears to be bold and steep, we consider that the lead would give little or no warning of a danger of this nature in day light with fine weather while steering parallel with the coast. In this we are supported by the evidence before us. The compasses were sufficient, and their errors known to Captain Keen and properly applied by him. Although from the charts, Ex. 1 and 2, it appears that the coast has been indifferently surveyed, and the Admiralty sailing directions enjoin caution in navigation; it, however, appears from the evidence to be the custom to hug this coast while going northwards to avoid the strong southerly current. We are of opinion that this custom or practice is not prudent or advisable under the present existing survey of this coast, and that Captain Keen committed an error of judgment in navigating his vessel so near to the shore. We consider, however, that although Captain Keen was in error in navigating so close to the coast, he appeared in all other respects to have taken all customary precautions while navigating personally in the locality, and to have navigated his vessel in a seamanlike manner. We are not of opinion that there is any evidence upon which a charge could be framed. Under the circumstances, we think the justice of the case will be met if Captain Keen be reprimanded. From the charts, Ex. 1 and 2, Nos. 2087 and 2088, which, we are informed, are the latest available, it appears that this portion of the coast is very indifferently surveyed. We are of opinion that considering the increasing importance of the traffic along this coast there should be a more accurate survey of it, and that the matter should be brought to the notice of the hydrographer to the Admiralty. Chief Clerk, Calcutta Port Office.